In Calif. Gold Country, A Rush That's Out Of This World When a meteorite crashed down in April on the exact spot where gold was discovered in 1848, professional and amateur meteorite hunters alike fanned out to collect small chunks. Now more than 50 scientists have published an analysis of the rare space rock. A section of the Sutter's Mill meteorite, dubbed "Darth Vader," is studied at a lab at the University of California, Davis. The meteorite is made of carbonaceous chondrite, which contains materials that formed the planets of the solar system. He looked up to see if there was an airplane in distress. "I did see a small trail of brown dust way up in the upper atmosphere," Allen says. "It was so unremarkable I didn't put the two together." But within a day he was able to connect the dots. Reports of an impact were all over the local news. And, as his brother Norm explains, it didn't take long to pinpoint where the remnants had landed. These words all apply to rocks from space, but each has a somewhat different meaning. Asteroid — A chunk of rock traveling around in outer space, typically orbiting the sun in a zone of rubble called the "asteroid belt," which is between Mars and Jupiter. Meteor — That's the flash of light you see in the sky when space rock hits the atmosphere. Usually meteors are generated by rock the size of sand or gravel. Meteoroid — A generic term for a piece of rock, traveling through space. It can be a bit of an asteroid, or a chunk of a comet. Meteorite — That's the rock you pick up off the ground (if you're really lucky) after a meteoroid lands. "Apparently the weather radar actually picked it up coming down," Norm Allen says. And that impact zone just happened to include the Marshall Gold Discovery State Park, where Ed and Norm Allen are volunteer docents. That's the site of Sutter's Mill, where the California gold rush all began. Within days, another rush was on — in a state park that happens to allow visitors to pocket any interesting rocks they might find, gold or otherwise. "There were professional and semi-professional meteorite hunters out here, as well as just mom and pop with the kids," says Norm Allen. "In fact, one lady was pushing a baby carriage and found one of the bigger pieces that was found, right off the bat." The biggest chunk was about the size of a fist. And soon professional scientists were on their way. "It became quickly clear that this was a rather exceptional asteroid impact," says Peter Jenniskens, from the SETI Institute (SETI being the Search for Extraterrestrial Intelligence). Jenniskens led the scientific search. First, he instigated the search of weather radar data to pinpoint the landing site. He also collected photographs and video from a few bystanders in the High Sierra. From those his team was able to conclude that the object was apparently a chunk of asteroid, probably weighing 100,000 pounds when it hit the atmosphere, and traveling at a blistering speed — 18 miles a second. "Because it came in so fast, very little survived," Jenniskens says. "But because it was so big, we still got to find something." Robert Ward found a piece of the meteorite at a park in Lotus, Calif., on April 25. The 100,000-pound meteorite was blown apart into small pieces as it met the Earth's atmosphere. He hopped into his car and drove up to the park. On his first day of prospecting, he'd been off beating the bushes for hours near Sutter's Mill without luck. He'd given up for the day. "I'm standing there, waiting for my friend to open the car, a little impatient. Then just a few meters from the car, I see little black rocks on the pavement. And I'm thinking, 'It can't be, can it?' "
But it was — small bits of this unusual space rock. And it was different from the usual meteorites, which look like Earth rock. "Most meteorite falls we're getting on the Earth are from the terrestrial kind of stuff. Chunks of rock," Jenniskens says. "This is more interesting. This is the type of meteorite that carries organics with it to the Earth, that must have brought in the carbon that you and I are made out of." 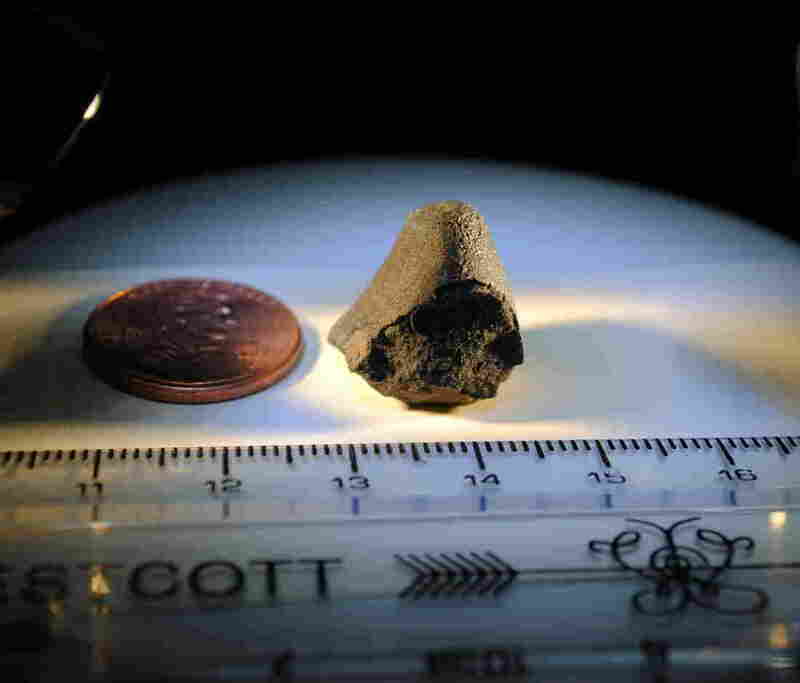 It's called a carbonaceous chondrite, which is lighter and more porous than typical meteorites. That means the mineral is very susceptible to water damage once it hits the ground. Scientists were fortunate to have collected chunks so quickly. 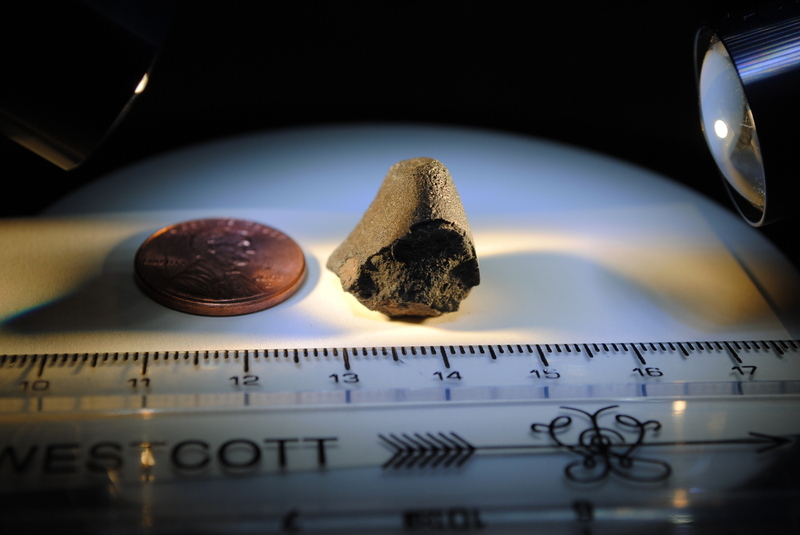 "We actually got to see this type of meteorite in a pristine condition, sort of what you would get if you would go to an asteroid in space and you would collect a sample from this type of asteroid," Jenniskens says. 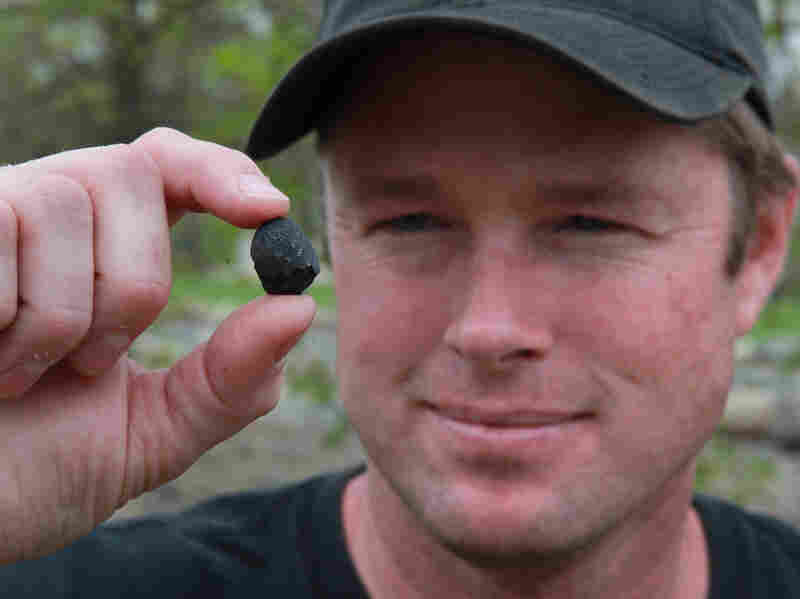 People ultimately collected about two pounds of the Sutter's Mill meteorite. And more than 50 scientists joined up as a consortium to study the rare space rock. Their first report appears in Science magazine.